Rate this card now and let others know your thoughts. 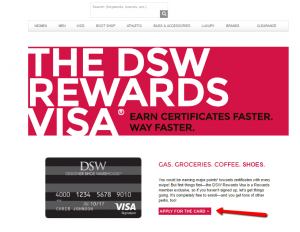 With its generous points reward system, signup bonuses and free return shipping for all DSW products purchased online, DSW Credit Card is a perfect choice, particularly if you like to shop at Designer Shoe Warehouse. On this web page we will provide a step-by-step guide on how to apply for getting this card. Step 1: Open the credit card’s main webpage and click on the ‘APPLY FOR THE CARD’ button. This will open the log in page. In case you already have an online account you should introduce your username and password and log in, otherwise you will have to create a new account as we explained on our page dedicated to how to login and activate/register your card. Step 2: After logging in or setting up a new account, you will be able to apply for a card by clicking on the ‘Start application’ button. 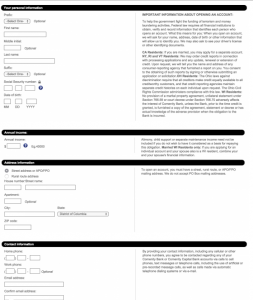 Step 3: After logging in or setting up an account, you should introduce your personal information (name, social security number, date of birth), your annual income, your address and your contact information (phone, email). Step 4: Finally, you can add an authorized buyer and, optionally, a referral code and click on the ‘Continue’ button to submit your application. Q: My DSW Credit Card has been replaced and I got a new card. What should I do with the old credit card? Once you get the new credit card, your old one is not active any more so, you can destroy it. Q: How can I get the customer service? Customer service for Comenity bank clients is toll-free which means that they can call the service on the phone numbers provided on the site, without being charged a long-distance fee for the call. Numbers are 1-855-506-2496 and 1-800-675-5685. Q: I have found that something is wrong with my billing statement. Who should I talk to about it? There might have been a mistake in your billing statement and if you think you have been incorrectly charged, you should call the customer service phone number on the back of your credit card and explain the problem to the bank’s representative. They will do their best to correct the mistake if it is really made. Q: Is it possible to make payments from a bank which is not in the United States? Unfortunately, that option does not exist since online payments are only accepted through United States bank accounts. Q: What do 4-digits on my credit card represent? The CVV Number or the Card Verification Value number that can be found on your American Express credit or debit card is the four digit number that you can see. You might be asked by some merchants to provide that number, so as to prove that you actually have the credit or debit card when you shop online or via phone.